Reversing tooth decay. Those three words sound way too good to be true. So it must be impossible, right? Not so fast. As any mom, I want my kids to have healthy teeth. Lately I have been running into mom after mom after mom who have witnessed with their own children (and themselves) that reversing tooth decay is possible. It's something nobody talks about and your dentist will tell you it's not possible. I am on a quest to find out! Baby E's teeth have gotten so bad. Surgery is not a way out, it doesn't get to the root of the problem (pun intended). But that's the first thing any dentist will recommend. As you know, I'm not one for band-aid solutions. I read Ramiel Nagel's book, Cure Tooth Decay, selectively this year. To be honest, switching our diet so drastically spooked me away at first! It was too much to handle at the time, with a new baby and all. But it looks like now we are ready and we need it. Crazy dental bills will cost us way more than the extra expense of good quality food, meat, and milk from local farmers! This isn't going to be easy, for sure. No grains and no sugar (short version)? We've been practically eating an entire loaf of my homemade bread every one to two days the entire year! We've been relying on white flour as a cheap filler. Yes, I make everything from scratch. But still, white flour and sugar have wreaked havoc on our health lately and we know it. So I am taking all of you on this journey with us! Do you want to see if it is possible to reverse tooth decay? To fill a cavity without going to the dentist? What other health improvements will we see with a nutrient rich diet? I am eager to find out! I need all of you to help us stick with it. I will need encouragement to keep this going. I will need your fabulous ideas for recipes! I will share ours as well. If any of you want to attempt a tooth healing, traditional foods way of life this year with us, you'll need Cure Tooth Decay. You can do without it, but it would be kind of hard since I cannot possibly give you all the detailed information that Ramiel has outlined in this book. Next week hopefully we will make our way to a local farm and delve into eating grass fed meat and real milk. I'm so ready for some real food. I miss it from the days of my childhood summers in my grandparents' village! Have you ever heard of the Traditional Foods "diet"? Perhaps you're a veteran? If not, are you interested in learning with me if reversing tooth decay is possible? I am interested to hear about your transformation! My focus on the past two years and even more so this year has been on eating real food (real meat, real fats, real dairy, etc.). I have slowly been substituting white sugar for more natural sugars like honey and white flour for stone ground whole wheat flour, grass-fed beef, local non-homogenized milk, grass-fed raw cheeses, etc. Yes, it's more expensive on some accounts, but you will get skilled at finding deals. I buy what is on sale at Whole Foods. I buy flours and grains from the bulk sections. You would be surprised how cheap you could get organic stone ground whole wheat flour from the bulk bin. I always try to think about it in terms of paying now instead of paying later. You are investing in your family's health and this will pay dividends. Thanks for your comment! Until now we were buying bulk flour in 50 lb bags, just $16 a bag! Now that's cheap! We were going through an entire bag in just 2-3 months. We eat a lot of bread, I would mix whole wheat and plain unbleached flour. But with Ramiel's protocol for healing tooth decay there are NO GRAINS, the only thing I will possibly attempt to make is bread or some baked goods out of coconut flour and 100% rye sprouted flour. Maybe one loaf of bread per week and waffles on weekends. If we were just following Weston A. Price recommendations, we would have used sprouted flours for baked goods. But that will not help much with tooth decay, you really have to go grain free. I've begun a more primal way of eating. Www.17recipes.com is a favorite of mine! She transforms foods we love into paleo recipes. See what you think! Thanks for the recommendation, looks like a great blog! Good to know Julz, I didn't know you were grain free, I think your sister might have mentioned it! I'm going to have to go subscribe to all those blogs you mentioned. Since we haven't made it out to the farm yet we've been eating a ton of plain organic eggs! I am craving to try real milk, pastured eggs, and grass fed meat so bad! Hahaha, I'm already having those days when I WANT SUGAR! It will take me a while! We're used to having homemade cookies and pies pretty much every day, so I know it will not be easy. It's been gradual because of the holidays, just before we started we had 4 days straight of family parties with junky food. Since Wednesday we also had company over 3 times and there were sweets. But I am no longer making any bread and my bread-maker is taking a breather (I might use it to make meatloaf from grass-fed ground beef). I can't wait to get my coconut flour I ordered online so I can make some not sweet baked goods for our transition. It's hardest for the kids, but Baby E understand we're in this to save her teeth! About a year ago my dental x-rays showed I had two almost cavities on my front teeth. the dentist gave me some prescription toothpaste to use once daily. This year when I had my x-ray the places were gone. So tooth decay can be reversed. I don't know if this toothpaste is available for little kids though. That's great! Thanks for sharing Rachel. I guess the toothpaste may have helped. We're talking about reversing tooth decay through diet though. The amazing thing is that when Weston A. Price traveled the world and met indigenous people - many of them had 0% rate of tooth decay and they haven't seen a toothbrush in their life :) It was their diet of 'as found in nature' animals, plants, and seafood that yielded these results. They knew no flour or sugar. I find that very fascinating! My 4 year old isn't that great at not swallowing toothpaste, so a prescription one wouldn't be very good since I am sure it has stuff in it that isn't meant to be swallowed (like fluoride). I love to bake, and that is my weakness, during the holidays i've been baking cookies more than i usually do. We are not white flour eaters at all, i don't bake bread often almost never, but we do eat sprouted whole grain organic bread often. Our grocery bill is going over the budget for sure and yet im looking for more healthier way of eating, i would say i get more excited to go shop for clean food than go shopping for anything else. I've been researching so much. Not sure how fast i'll get there but until i educate myself well enough im looking forward to a change. Im reading Gut and Psychology Syndrome book which i recommend to all. With the help of my local library they ordered this book to add to their addition and im first one to have it in my hands to read and will keep renewing it until im done reading it. It's such an eye opening. My husband need better diet, and all of us will fall along with him to support him. It would be quite change, and everyone around me think im a bit crazy but im going for it! Perhaps i don't know how challenging it would be and i know we will fail many times but i want to get to the point what works for us. Baked goods are our family's weakness for sure :) "Teplie bulochki", those two words melt my heart, hehe. But I'm glad to see that eating healthier is on so many people's minds, when we are surrounded by so much junk and food-like products. It's definitely expensive, we're always looking for ways to save on better quality food, so I'm hoping to develop some long term relationships with local farmers! We're in this for Baby E, but really we all need it. I know how awful my skin looks when I overdose on four and sugar. Hubby has other problems that need a diet adjustment, and Baby T needs a good start on his new teeth coming in. We all need it! Thank you so much for your comment Luda, I always enjoy reading your comments! :) Hehe, I expect I'll get many more comments from you, especially on my next diet post! Don't worry, I know that the idea is to eat more nutrient dense food, I am not attempting to continue with all my baking just with a substitute. I might bake once a week instead of the 5 times a week I did before! Then maybe even less once we have access to farm fresh goodies! This morning we had an omelette, 5 eggs with sauteed onions in butter, mushrooms, and 'salo' :) I am compiling recipes of different ways to make eggs for breakfast, I think I'm going to have like 25 options! The unfortunate thing is that we visit family almost every weekend, either on his side or mine (nice to have them all here). But they don't really get it, though they are interested as to why we are doing this. But my father in law is pretty clueless, as in while eating store bought cheesecake with a list of 20 ingredients he said in reference to Baby E "It's not that bad, it's not like she is eating sugar", I had to hold myself back from bursting with laughter! So when we are visiting others, I'll have to bring my own most of the time. Don't you just love how people will ask IN FRONT OF YOUR CHILD "Oh, she can't have this candy?" Drives me up the wall! Anyhow, I'll stop ranting. But having relatives here will make this so much harder. Yea we don't eat cereal much here either but I did like that she soaked her flours in yogurt for 24 hours to kill pretty much everything...so I wanted to share that.... Also, in regards to baking, you only need half a cup of coconut flour to bake a dozen of muffins (: because with coconut flour, majority is, really, eggs! So for every cup you do 8 eggs plus milk....it works out (: I bought shredded coconut. I actually make milk out of that and the pulp I dry in my oven and blend the dry shreds in my blender and it turns into flour so it works for me! Good luck on the diet (: wellnessmama.com started a healthy challenge that has many recipes you would like, I think. Hope all is well. In addition to the teeth healing protocol outlined by Weston A Price, we have started adding Concentrace drops (minerals) to the milk or water that our 2 yr old drinks, and also almost daily Epsom salt baths (magnesium). So far so good! Given all the sugar in processed foods, I am not surprised that this is a problem. Our family just went veggie, and our dentist says he sees the best teeth on kids who are veggie! You're right, processed foods are loaded with sugar. I was surprised though because we do not eat processed foods (for the most part) since my daughter was born. I make everything from scratch. So I was surprised to learn that sugar and flour as we know it is the culprit, even if you use it to make your own baked goods at home. We're already seeing many health improvements going grain and sugar free for our whole family :) And it's been just 2 weeks! Thank you so much for the information. I am going to speak to my granddaughter's dentist right away about this issue. I just read your post and skimmed the comments. You don't seem to talk about IF and HOW OFTEN you brush your daughter's teeth! I've found parents dont' KNOW that THEY have to brush their children's teeth until at LEAST age 6. Twice a day. And one needs to be right before bed. Your child has decay that I have trouble believing she could have if your brushed her teeth. Also, is your water Fluridated? I know, fluride is a carcinogen. I'd rather have fluride toothpaste and rince than drink it every time I use water. I think topical fluride is much safer. It hardens the teeth. It's not safe though for little kids to use fluride toothpaste because they swallow it. Sometimes parents use it on their kids...tiny peas sized amt. Thanks for your comment! Wow, I'm sorry but I don't know of a single mom who doesn't know she should be brushing her child's teeth! I guess I don't hang around those circles, around here we believe in common sense. :) Yes, of course we brush our teeth. Why would I be posting about my daughter's tooth decay on the internet for everyone to see if I didn't have so much as common sense to brush her teeth??? If you have time, please familiarize yourself with the work of Dr. Weston A. Price who discovered people living far off who had no access to modern foods such as processed grains and sugars, they had NO TOOTHBRUSHES, and had ZERO tooth decay. No fluoridated toothpaste or water, no floss, no mouth rinse, ZERO tooth decay. Not even cavities. There is much more to this than a dentist will tell you. The moment the modern diet became accessible to these indigenous people, their tooth decay rates soared. It was what they ate that affected what their teeth looked like on the outside. Our entire body is designed to be nourished from within, not masked on the outside just to look good while we eat empty calories without nutritious merit. No thank you, I don't want a tiny pea size amount of carcinogen for topical treatment for my child. I would rather find the root cause of the problem instead of looking for band-aid solutions. I appreciate your concern! I've just read through a lot of the comments and got some really useful ideas. I've been so worried about my 1 year old's teeth. This brought up some things I had never thought about. Hi, please share the name of the cod liver oil you are giving your children. I would like to buy some for my family too. Thanks, a new reader of your blog, Juliette. Thank you for your comment Juliette! Although ideally we would be taking Green Pastures Cod Liver Oil (found here: http://amzn.to/YBXjT8) because it isn't heat processed but rather fermented as it has been done in centuries past, it is out of our price range. Right now we are taking krill oil and we have an open giveaway for it as well. But in the long term we may opt for the less expensive option of Double Strength Cod Liver Oil Capsules from Swanson Vitamins. I'm also contemplating the krill oil they offer. I will do a post sometime soon about our current cod liver oil experiences. Thank you for stopping by! This is the second time I have heard about healing tooth decay naturally. The first one was about eating eggshells and I think taking the codliver oil also. My daughter just lost her first baby tooth and her new one is coming in rather yellow. It is very interesting that our childrens teeth our being affected. I totally agree it is in the food and am very interested in looking into this diet. Did a dentist diagnose fluorosis? I suggest you get those teeth removed asap before she gets an abscess. Teeth like that are a health hazard as bacteria can get in through weak teeth like that and cause infection and cardiovascular disease. My son has enamel hypoplasia and no diet is going to improve that, or your daughter's teeth when they are that far gone. They are possibly also sore and sensitive. You are being cruel and selfish letting her walk around like that! Natural remedies are all very well, but seriously get in touch with reality and get her to a dentist. So I guess it is selfish of me instead of taking the easy way out to spend 80 hours researching the subject, buying minerals, cod liver oil, remineralizing toothpastes, grass fed butter, making my own bone broth, and spending every day administering all this to my child. Clearly I must be selfish, right? FOR YOUR INFORMATION, we've been on this diet all winter and spring and it has done amazing things for her teeth! They mostly remineralized, turned hard, and the enamel is coming back. A lot of the brown spots are gone. All of this a dentist would say IS NOT POSSIBLE. How much can I trust a dentist now that I know what they say is not possible in fact is? I am very much in touch with reality and though I understand your concern, this is not your child and you don't know half the story. If she complained of any tooth pain or if it in any way made her uncomfortable I would take her to a trusted pediatric dentist right away - even if my insurance doesn't cover it and I would have to pay out of pocket. She hasn't ever, not even once mentioned any tooth sensitivities or pain - and she is the kind that will complain about the tiniest scrape on her knee. If you are interested in further reading on the subject, here are some suggestions. I am so grateful that you wrote about this. My son's teeth have begun to decay and it happened so fast! We used to eat sardines for breakfast or lunch almost everyday. I wonder now if when we stopped was when his teeth started getting bad. I look forward to reading your recipes and updates. Thank you so much! Thank you for your comment Toni! Sardines are really good for teeth, they are loaded with minerals. Getting an update up is in the works, but it's hard - not easy to get a good photo :) I'm working on it, it'll take a while to write. Hello, I wanted to see how everything worked out for you. I am trying to heal tooth decay. 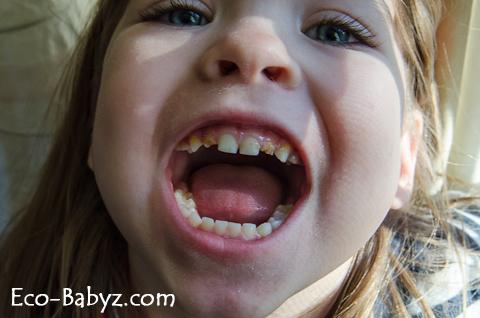 How did the healed teeth turn out for your lo?